1096 MH Germany - inventory from approximate 160 mint never hinged stamp booklet in the Lindner ring binder, many issues Federal Republic of Germany from stamp booklet Heuss with variety, fluorescent booklet, watermark sideways, Brandenburg Gate, prevention of accidents and so on. To sights, as well a few booklet Berlin and German Demokratic Republik (East Germany). 1098 ⊙/ / 8b Germany - collection in the safe ring binder, as well Third Reich with complete issues, winter help work, comradeship souvenir sheet, issues brown and blue ribbon, Gdansk farewell series complete, then island post Michel no. 8 b expertized cheater, Christmas stamp island Rhodes used, postwar Germany with allied occupation, Federal Republic of Germany and so on. 1103 Al✉um Germany - Lindner T hingeless printed form ring binder in claret complete for the areas French zone, allied occupation and American/British Zone. The contained stamps are uncharged. 1107 Literatur Germany - Michel, Germany special catalogue 2016, both volumes, original price 172,- €. 1111 Literatur Germany - Michel, Germany special catalogue 2015, postwar Germany (volume 2). Original price 84,- €. 1198 Kart⊙n Germany - extensive inventory, as well German Reich with old kilo ware, letter pieces, Infla and Germania frankings, much material Federal Republic of Germany with nice used collection in the illustrated album, Euro novelties, mint never hinged collection Federal Republic of Germany 1966 / 92 in the number of a major listing complete in two Lindner album pages, Berlin mint never hinged collection 1965 / 90 and so on. 1260 ⊙/ Germany - rustic old collection in the Borek illustrated album, as well collection Bavaria from the quadrate issue, a few values German colonies, as well good part German Reich 1872 / 1945 including with breast shield issues, Germania, Infla well represented, Weimar Republic with help in need, Zeppelin, Third Reich good sets, Wagner set nine values complete, Occupation state 1934, souvenir sheets, Munich Riem overprint block 1937 with first day cancel, winter help work and so on. Subsequent still a few occupation issues II. World war. A few values in the album stuck. Very high catalog value! 1262 /⊙/ Germany - extensive old collection in the thick Schaubek album including with issues Old German States, many values German Reich, Third Reich with complete sets, occupation issues II. World war, Gdansk, Memel, Saar, postwar Germany, American/British Zone with export fair souvenir sheet, French zone and so on. Much material and high catalog value! 1282 Kart⊙n Germany - extensive lot in 11 albums, as well good filled duplicates-albums, stamps from German Reich, postwar Germany, allied occupation American/British Zone, Berlin with a lot of mint never hinged material, also numerous blocks of four with youth and welfare series and high post price, collection Federal Republic of Germany 1980 / 2000 mint never hinged in two SAFE hingeless albums and so on. Favorable! 1287 ⊙/ / 2 Germany - rustic old lot in the stockbook, as well issues Old German States with stamps of different areas, Saxony from Michel no. 2, then good part German Reich from breast shields, Germania, Infla, Third Reich with complete sets, winter help work, issues brown and blue ribbon, official stamps, occupation issues and so on. 1288 Kart⊙n Germany - versatile lot with stamps in stockbooks, as well German Demokratic Republik (East Germany) early values with complete issues, German Chinese friendship 1951, postwar Germany with allied occupation, French zone with special stamps, Rhineland-Palatinate Red Cross set and souvenir sheet mint never hinged with buildings, export fair souvenir sheet, Berlin with beginning valued, welfare 1949, Bach seals, Berlin and so on. 1469 /⊙/ Germany - extensive lot in a large stockbook, as well allied occupation including many se-tenant export fair, with also strip of three and block of four se-tenants, French zone well-staffed, with also Rhineland-Palatinate 8 Pfg. 3. 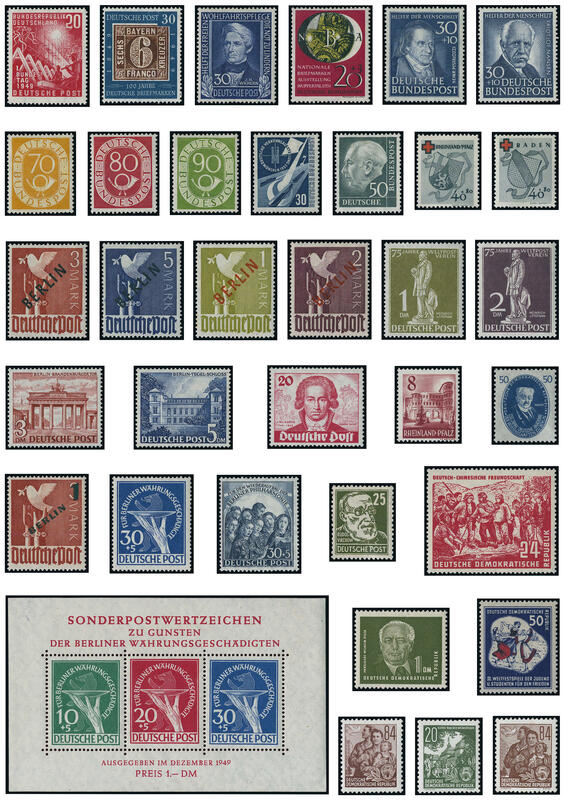 Postal stamps issue twice, of it a round cancelled copy expertized Schlegel BPP, as well an extensive part American/British Zone with a lot of first issue of stamps for Germany after WW II., with also 80 Pfg. Many times presented, ribbon and net overprints abundant, as well buildings including mark values. Favorable valued inventory with very high catalogue value! 1476 /⊙/ Germany - enormously extensive inventory all mainly mint never hinged formed in a large thick stockbook with only special feature, plate flaws, accidents in printing and so on, all mainly Federal Republic, with numerous special- and commemorative issues, welfare values, souvenir sheets and so on. With also miniature sheet 110 Pfg. German federation of trade unions 1999 in the incorrect perforation miniature sheet, as well also further areas. An interesting inventory! 1478 / Germany - enormously extensive lot of accidents in printing, plate flaws and so on. Housed in two large stockbooks, as well German Reich, as well lots of Federal Republic of Germany, as well also Berlin and so on. A large amount of material! 1479 /⊙/ Germany - extensive lot in four stock books with numerous accidents in printing, plate flaws and so on. As well German Demokratic Republik (East Germany), Federal Republic of Germany, much first issue of stamps for Germany after WW II., allied occupation, French zone and so on. A delightful inventory for specialists! 1526 /⊙/✉ Germany - nice collection \"German permanent issues\" in two large ring binders clean made up with inscription. As well numerous mint never hinged and used issues, as well documents. Included are issues German Reich, allied occupation, Federal Republic of Germany / Berlin abundant, as well German Demokratic Republik (East Germany). Interesting collection! 1529 /⊙/ /✉ Germany - extensive inventory in five large albums and stock books accommodated with a lot of material. As well a collection \"German unit\", a collection French zone, an extensive inventory German Demokratic Republik (East Germany) from the beginning years including academy 1950 and many blocked value series, German Reich and so on. Favorable valued! 1564 /✉ Germany - nice and rich collection on the subject of reunification with numerous mint never hinged issues as well beautiful documents from Federal Republic of Germany, Berlin and German Demokratic Republik (East Germany) in four Lindner respectively Borek ring binder formed. With also philatelic-numismatic covers. Huge subscription price! 1609 x Germany - extensive inventory in four large stock books and a ring binder accommodated, as well lots of mint never hinged material, including sheets New Saar and Federal Republic of Germany, extensive mint never hinged stocks Federal Republic of Germany, with also numerous blocks of four, as well also French zone and so on. Favorable treasure trove! 1719 / Germany - nice and rich collection the post-war period in two Michel ring binder. As well Federal Republic of Germany abundant including all beginning valued from Lower House of German Parliament with the sets helper of human resources, Bach seals, posthorn set, Heuss 1954 and so on. Furthermore Berlin with all beginning valued including black- and red overprint, buildings set, Goethe set, green overprint, monetary reform vitims set and monetary sovenier sheet. Besides allied occupation and American/British Zone with different issues, an extensive part French zone, Soviet Zone with different issues and complete sets, as well an extensive part German Demokratic Republik (East Germany) including many good beginning valued, with also academy 1950, German Chinese friendship, heads set with German Demokratic Republik (East Germany) watermark and so on. Favorable valued!